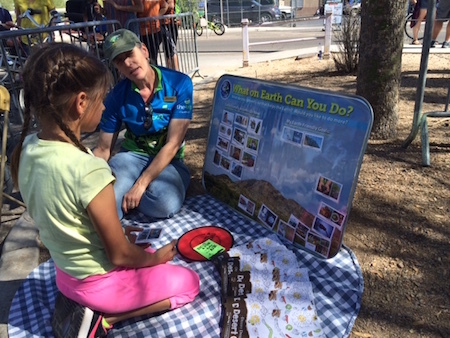 Pima County Department of Environmental Quality (PDEQ) will be joining the Tucson Earth Day Festival celebration on Saturday, April 21, at the downtown Children’s Museum Tucson and Armory Park at 200 S. 6th Avenue. The festival is free, open to the public and runs from 10 a.m. to 2 p.m. Dozens of exhibitors will provide interactive hands-on activities, sharing information and displays related to transportation choices, native plants, healthy air, water conservation, sustainability, energy efficiency, waste reduction, and more eco-minded topics. Numerous opportunities will be available to discover how helping the planet helps you, too! Since April is Bike Fest month, consider riding your bike to the event and safely park your trusty steed at the free Bike Valet Parking area. If you are not up for riding a bike or driving downtown, the Sun Link Streetcar and Ronstadt Transit Center are a short walk away from the festivities. The Children’s Museum Tucson will be free for the day (adults must be accompanied by children, and children must be supervised by adults). PDEQ, along with other Pima County departments, sponsors the Tucson Earth Day Festival to promote a healthy, sustainable community. Be sure to stop by PDEQ’s booth to play the Spin & Learn Wheel of Wisdom to test your environmental acumen and win a prize. Several years ago, Pima County Department of Environmental Quality (PDEQ) Clean Air Program created an inspirational poster and bookmark, combining the beauty of the desert with 50 Ways to Green the Earth. Check out some options there and/or read below for a dozen tips to consider if you would like to live more gently with the planet. Buy “vintage” from thrift stores for one-of-a-kind clothing and furnishings. Conserve water by harvesting rainwater and catching pre-hot water in the shower with a bucket. Avoid idling your vehicle’s engine at school drop off/pick-ups and drive thru windows. Park the car and go inside to help keep the air healthy to breathe. Drive less - carpool, ride your bike, walk, use public transportation or drive an electric or hybrid car. Motor vehicle use is the single largest source of air pollution in Pima County. Take the stairs instead of the elevator to save energy (and enjoy the exercise!). Plant or donate a shade tree. Tucson Clean and Beautiful’s “Trees for Tucson” program sells shade trees for your home, which can reduce your cooling bill. If a tree is planted near the sidewalk, it can provide a shady place to encourage more walking. Replace inefficient incandescent light bulbs with the more energy efficient LEDs. Check tire pressure monthly and maintain proper inflation for safer driving, better gas mileage, longer lasting tires and fewer emissions. Avoid using disposable plastics, especially single-use plastics like bottles, bags and straws. Turn off and unplug electronics you are not using. This includes turning off your computer at night. Turn off the computer monitor when you leave the room. Use a fan to create a breeze around you and turn up your thermostat one or two degrees in the summer to reduce energy use and the associated air pollution. In the kitchen, reduce food waste by “shopping” in your refrigerator first and using what you have. Make a list before going to the store and include exact quantities needed to avoid over-buying. Incorporate a few meatless meals into your weekly meal planning. Incorporating one or more of these actions into your life will reduce air pollution, conserve water, minimize waste and reduce your carbon footprint. Combined with others, these actions can make a positive impact on the health of our community and the environment. For more information on the Tucson Earth Day Festival, visit TucsonEarthDay.org.